Chet, a K-9 trained dog who failed his final examine, lives and works with Bernie, a divorced, ex-army, ex-cop, private investigator. Together they toil in an unnamed desert city in Arizona, barely making ends meet, Bernie struggling to make childcare payments to his ex-wife. When a local mother calls after her fifteen year old daughter has disappeared they take the case. The father is certain that the daughter has run away, but Bernie thinks differently, though the lack of a ransom note seems to rule out kidnapping. Then their car is vandalized and Chet tasered and nabbed. 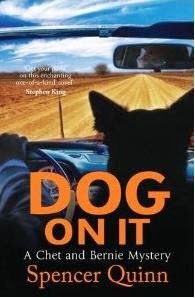 But Chet is no ordinary dog and once he and Bernie vow to find a missing person they stick to the task whatever the risks. Dog On It is told entirely from the point of view of Chet, a well-trained dog with a great sense of smell, an intuitive ability to read humans, who’s loyal and brave, and is easily distracted by food and the prospect of some fun. The narrative voice is engaging and well pitched and anyone who owns a dog will recognize his canine mind at work. The result is the reader is soon rooting for Chet the Jet and Bernie, his world weary, laconic private investigator owner, who can handle himself in a tight corner when needed. 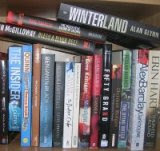 Indeed, the book thrives on the equal partnership. There’s a cozy sensibility to the tale, with a gentle humour running throughout, but Quinn doesn’t shy away from tough and dangerous moments, building the tension at a number of points in the story. The plot of tracking down a missing fifteen year old is relatively straightforward, with no major surprises, but it’s interesting enough. The real strength of the book, however, is the characterisation and the relationship between Chet and Bernie. Overall, an entertaining read that will appeal to all dog lovers, or those looking for a mystery with a novel point of view. Rob, lovely to see you review this charming book. I've given it to many dog lovers including a family member that declared it an important work to advance our understanding of zen buddhism. Once I retrieved my jaw from the floor I realized her point. Dogs live almost exclusively in the present moment. After hours of reading from Chet's POV I find myself buoyed and a bit blissed out by this approach.